The Barrie Farmers’ Market awaits you! These days, more and more people are making the healthy decision to buy locally grown fruit and vegetables, meats, dairy, eggs, baked goods, and handmade products from farmers’ markets. A wonderful connection is made when you talk to the people who take pride in producing your food! Once you visit our market, you’ll know why the Barrie Farmers’ Market is such an extraordinary shopping and social experience. We are older than Canada! 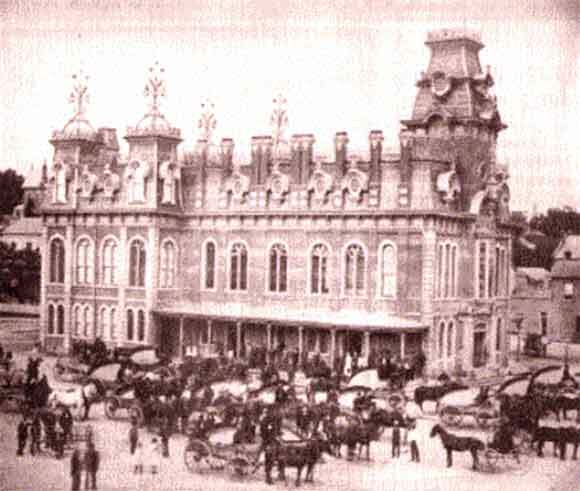 Market Square suffered damage by fire in 1875, was rebuilt in 1877 and enlarged with a new wing. The Market Square building served a double purpose as the first floor was for the farmers’ market and the second floor was the seat of municipal government. The site is marked today by a huge archway in the stylized shape of the original market building, bridging Mulcaster Street at Collier Street. By the 1950s, Barrie was evolving from an agricultural community to a more diversified economic base. The manufacturing sector dramatically increased in size, as did the retail sector. The Town needed room to grow and that included the downtown core. In 1952, Ontario Bill 27 came into effect. It nullified the Crown Land Grant and gave the Town of Barrie the right to do anything it wanted with the land. In exchange, the Town of Barrie took on the obligation to provide the Barrie Farmers’ Market with a building and a place of operation, which is why the Barrie Farmers’ Market is held on the premises of Barrie City Hall, both outside during the spring and summer months and inside the City Hall Rotunda through the autumn and winter. Bill 27 stipulates that if the agreement is no longer workable, that the City of Barrie must provide an acre of land and a Market House for the Barrie Farmers’ Market. This is the Market Square as it looked in the “grand old days”. Not only were vendors set up inside, but some chose to sell off the back of their wagons.